Research conducted by MSA shows that tropical cattle breeds have a negative impact on the eating quality of many cuts, in particular, the striploin, cube roll, tenderloin and oyster blade cuts. You wont find us sourcing this kind of beef! The effect of tropical breeds reduces the eating quality of cuts with high levels of connective tissue such as the brisket, topside, outside flat and eye round.Tropical beef cattle are breeds that are genetically adapted to tropical environments, which means they have a great ability to survive and re-produce in extreme and harsh conditions like heat and pastures that are of poor quality. 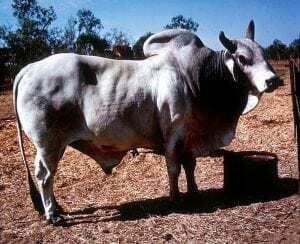 Tropical breed cattle are also resistant to some parasitises. This ability to survive and thrive in harsh conditions makes them a key breed of cattle for the northern reaches of Australia. Examples of tropical beef cattle breed are Brahman and Brangus and Santa Gertrudis (crosses of Brahman). A hump is a key and distinctive physical characteristic of tropical breeds. The height of the hump and weight of the carcase together are used to work out the tropical breed effect on the eating quality. Examples of temperate breeds are Angus, Hereford and Murray Grey (British and Europeans breeds). Even though the eating quality is lower if appropriate management strategies are enforced throughout out the entire production chain cuts that originate from 100% tropical breeds of cattle can still meet MSA consumer grade standards. For all breeds of cattle the correct holistic management (particularly stress management), plays a pivotal role in the quality of the end product and its eating qualities. We stock Angus beef that comes from our supply of all our Organic Red Meat, the Elliot family from out West Queensland. Shane stands by the philosophy that great management is the sole factor in meat quality. Shane also told us the reason he chose to steer away from tropical breeds, although they are hardy animals when compared with the Angus breeds, the eating quality is simply not comparable. For more information see the Meat and Livestock Australia site, click here!